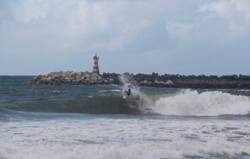 Between one of the most famous wave in the world, Super Tubos, and the Peniche harbor is another favorite surf spot called Molhe Leste (Eastern jetty). There are nice beach bars and calm atmosphere around. In the classic days can become crowded. The Molhe Leste surf spot is a local treasure. Be sure to respect the locals. Thanks to its sandy bottom, Molhe Leste can be good for surf lessons and beginners. But with bigger swells this surf spot is mainly for more experienced surfers. At Molhe Leste, next to the jetty, is possible to surf a good right wave. Come surfing to Molhe Leste when it is blowing the north, east or northeast wind. The best are west and southwest swells. 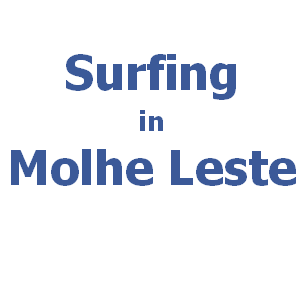 The best time for surfing at Molhe Leste is usually with the rising tide.